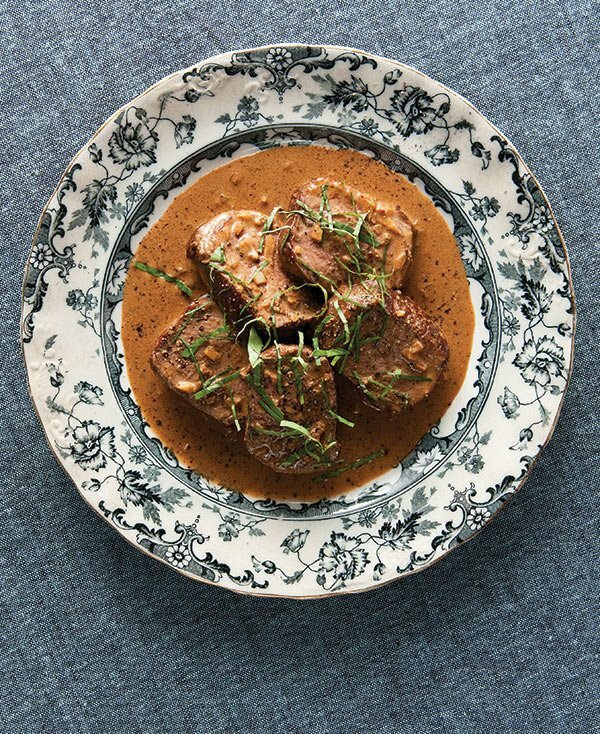 Most people who remember this dish remember it as beef filet mignon with a zippy sauce of mustard, Worcestershire sauce, demi-glace, cream and shallots — all flambéed at the table with cognac. back in 1907. And it was a sauce not for beef, but for venison. It is a classic for a reason. This sauce is so good you must have lots of bread around to sop it up. If you don’t, you will find yourself licking the plate, and that’s not very polite. 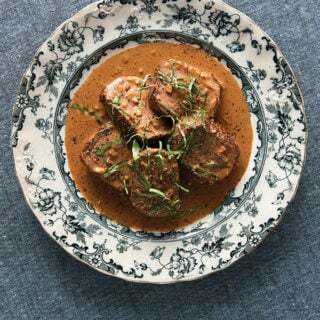 I developed this recipe after working with Elise at Simply Recipes on her version of steak Diane, and I am more than happy with my version, which is a little stronger flavored than hers; it seemed appropriate considering that venison is more strongly flavored than beef. Serve this with a big red wine, like a Cabernet Sauvignon, Carignane, Petit Verdot or Graciano. Steak Diane really needs a tender cut, and with venison that means tenderloin or backstrap. The best way to cook this is with a large piece of backstrap that you then cut into medallions right before you serve. If you have regular medallions, it will still work. While it is important to use heavy cream for this recipe (lighter creams will separate), it is not that important to have fancy brandy for this recipe -- just use something you would drink, OK? Bring the venison loin out of the fridge, salt it well and let it come to room temperature, at least 20 minutes. Heat the butter in a large saute pan over medium-high heat for about 90 seconds. Pat the venison dry with a paper towel and cook it on all sides. Turn the heat to medium so the butter doesn't scorch, and take your time. It should take about 8 to 10 minutes or so to get a nice brown crust on the venison without overcooking the center. Remove the venison, tent loosely with foil and set aside. Add the shallots to the saute pan and cook for 1 minute, then add the garlic and cook for another 30 seconds or so. Don't let the garlic burn. Deglaze the pan with the brandy, scraping off any stuck-on bits in the pan with a wooden spoon. Let the brandy cook down almost to a glaze, then add the venison stock, tomato paste, mustard and Worcestershire sauce and stir to combine. Let this boil down until a wooden spoon dragged across the pan leaves a trail behind it that does not fill in for a second or two. This should take about 3 minutes on high heat. Turn off the heat and let the boiling subside. Stir in cream until the sauce is as light as you like. Don't let the sauce boil again or it could break. Slice the venison into thick medallions. If you find you have not cooked it enough, let the meat swim in the sauce for a few moments to heat through. If the venison is to your liking, pour some sauce on a plate and top with the meat. Garnish with some chopped herbs. Chives are traditional, but basil and parsley are also nice. Looking for another classic to make with venison tenderloin? 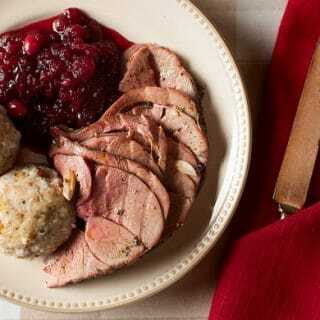 Try Venison with Cumberland Sauce. 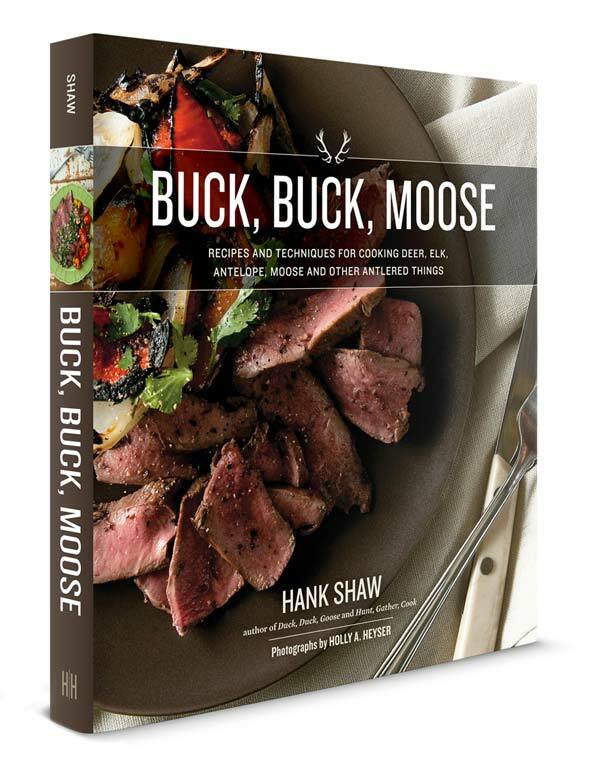 You’ll find nearly 100 recipes for all kinds and all cuts of venison, whether you have a little antelope or giant moose, right here on Hunter Angler Gardener Cook! We tried this for the first time tonight and it was really good. It makes a nice presentation. Both my husband and I commented on how guests would never know it was venison if you didn’t tell them. I was afraid the sauce would taste like brandy but it didn’t. I served it with rice this time but would do garlic mashed potatoes next time. My husband was afraid we would overcook the meat so we stopped a little short of complete browning and then had to cook more later so – follow Hank’s instructions! YUM. Thanks for the recipe! This is one of my all time favorite recipes. I’ve served it to those who “hate” venison and they were licking their plates. Had to assure them it wasn’t raw, though, as the meat comes out very red and juicy when cooked properly. Can I pre-cut the medallions, vac seal, and freeze them beforehand? Earl: I wouldn’t. But if you really want to, cut the medallions at least an inch thick. Are we talking dry mustard powder or prepared yellow mustard here?